Karen Dion gets high over Egypt and brings back a different perpective. 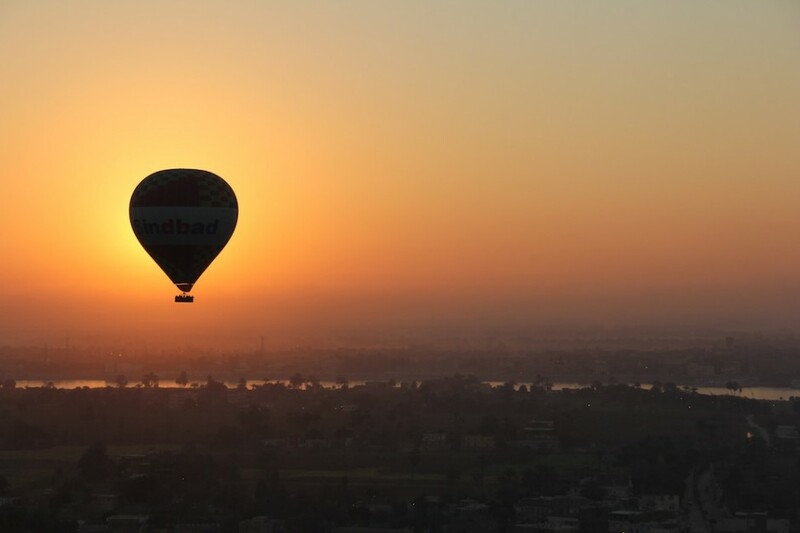 LOOKING AT MY list of “optional activities,” I had at first dismissed the idea of a balloon ride over Luxor’s west bank as a little too touristy. 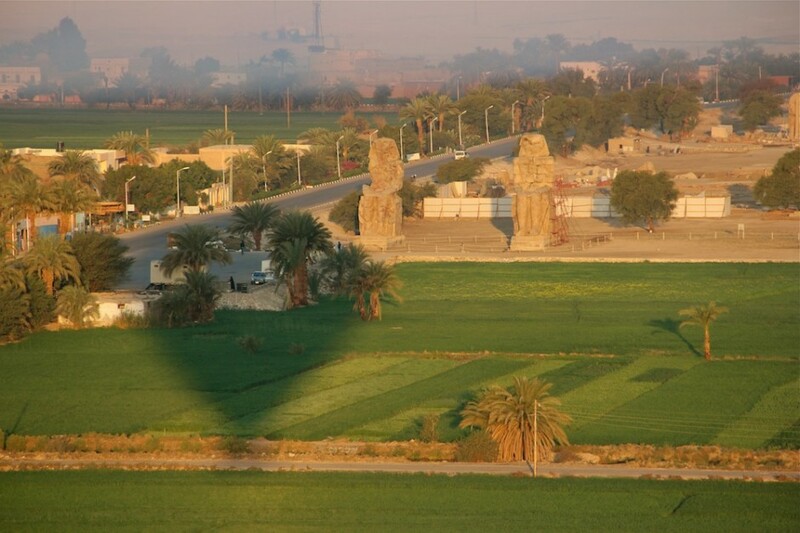 But I quickly changed my mind when I learned that it was archaeologists who first launched hot air balloons over Luxor as a new way of mapping the Theban Necropolis. 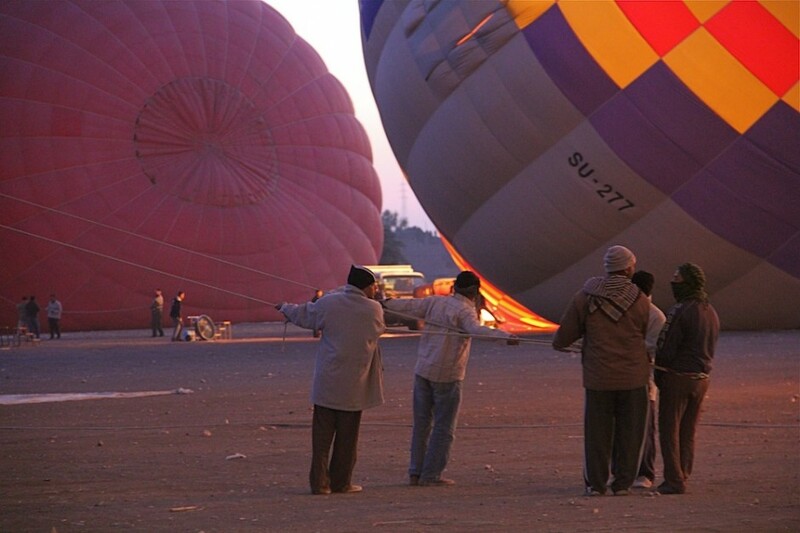 This fact gave the balloon ride enough credibility for me to get over my snobbery and sign up for the trip. Our day began in the chilly early morning, just before sunrise. We were ferried in a water taxi across to the other side of the Nile from our hotel (most hotels are located on the Nile's eastern bank). 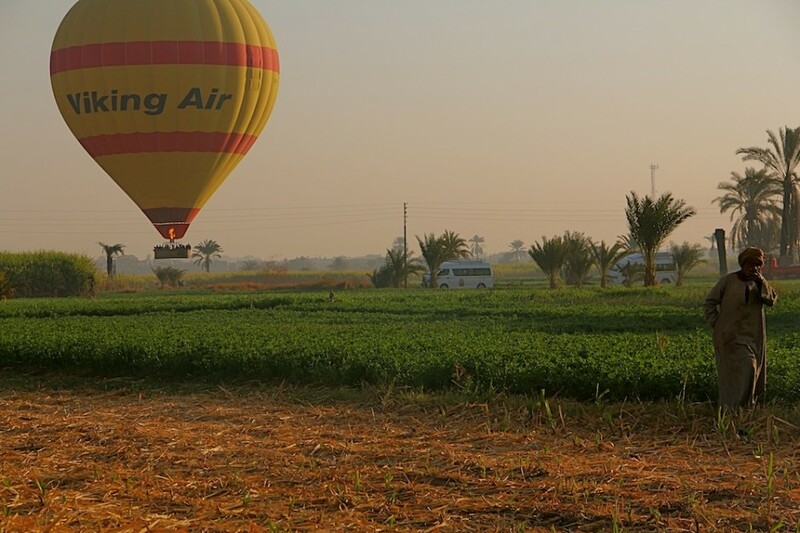 There are several ballooning companies in Luxor; you can arrange your trip by yourself or through your hotel or tour guide. The price is the same (around $100) with most companies. We assembled, along with dozens of other tourists, at the launch site and waited for confirmation that the weather today was safe enough for us to fly. The flight had been called off the morning before due to high winds, which I guess indicates a level of responsibility that is reassuring. A warm red colored the sky as workers rushed around rigging up baskets and examining the rising balloons, which soon dwarfed them. 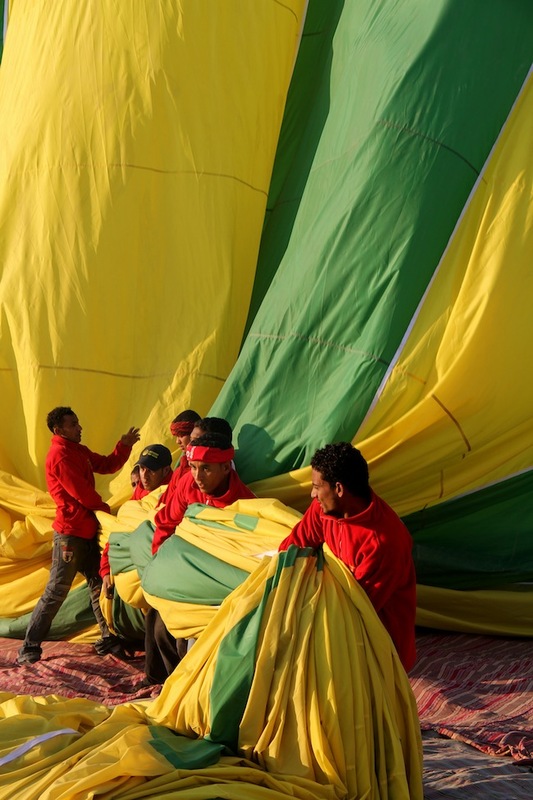 Drafts of flames flared up, warming the chilly morning, and the first balloon rose skyward, aided by the tugging of a small group of men bundled up as if this were the Arctic. While we were beginning our ascent, other balloons in the distance passed in front of the dawn sun, casting a heavenly glow across the sky. 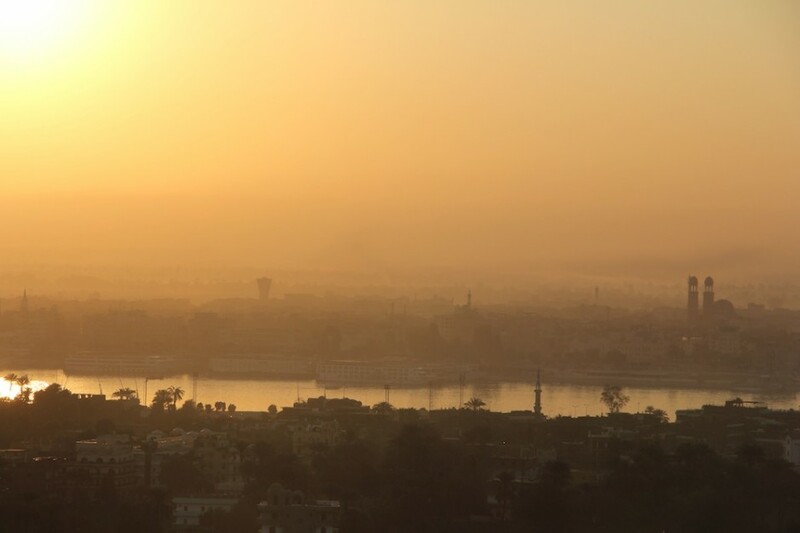 The dawn sky over the Nile's eastern bank created what was perhaps my favorite image of the morning. We drifted gently and peacefully across the lifeless desert. Viewing the area from above, I understood something of why this vast, empty space was chosen as the site to create a whole city of death. Beneath us lay the Theban Necropolis, testament to an ancient obsession with death and resurrection. It is strange, unusually beautiful, and very peaceful. Like a ghost ship we sailed over waking villages and ancient monuments. 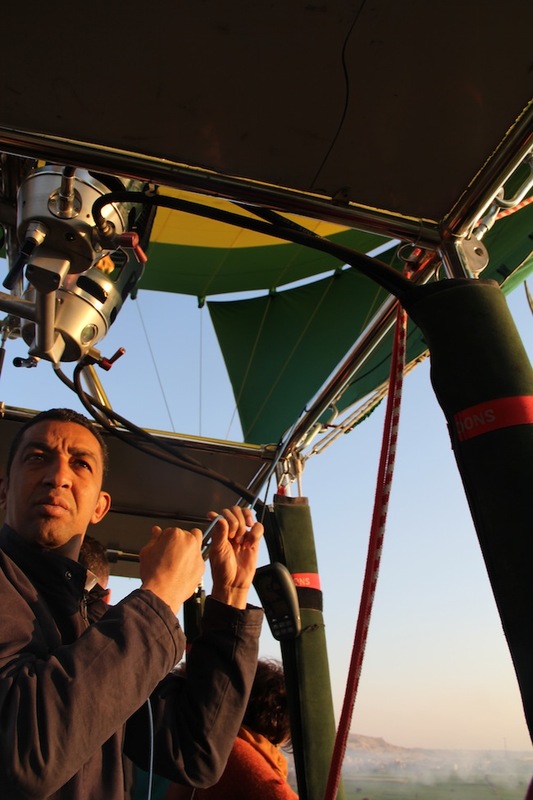 Our pilot, Mohammad, reeled off the names of each site as we floated gently with the wind. I had a sense that we were not really moving at all, just hanging suspended someplace between land and sky, life and death, past and present. We floated over the Colossi of Memnon, two massive statues that have stood in place for over 3400 years and once guarded the mortuary temple of Amenophis III, ninth pharaoh of the 18th Dynasty. 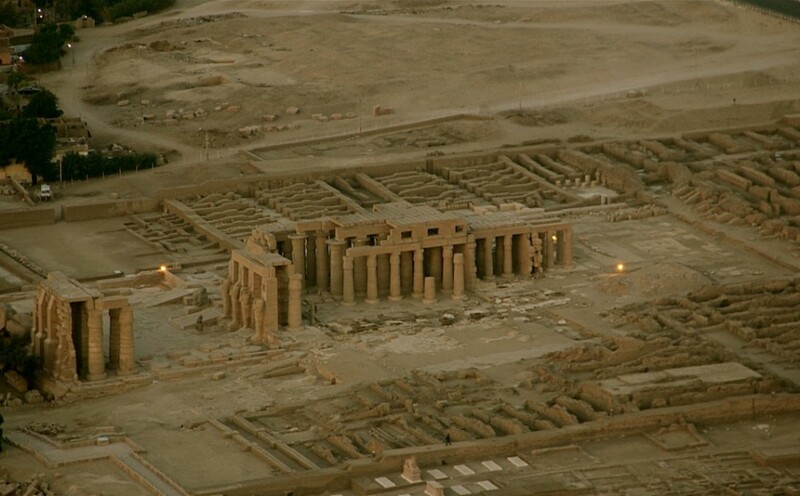 Thebes is home to thousands of tombs and temples, and is one of the world's most important archaeological sites. 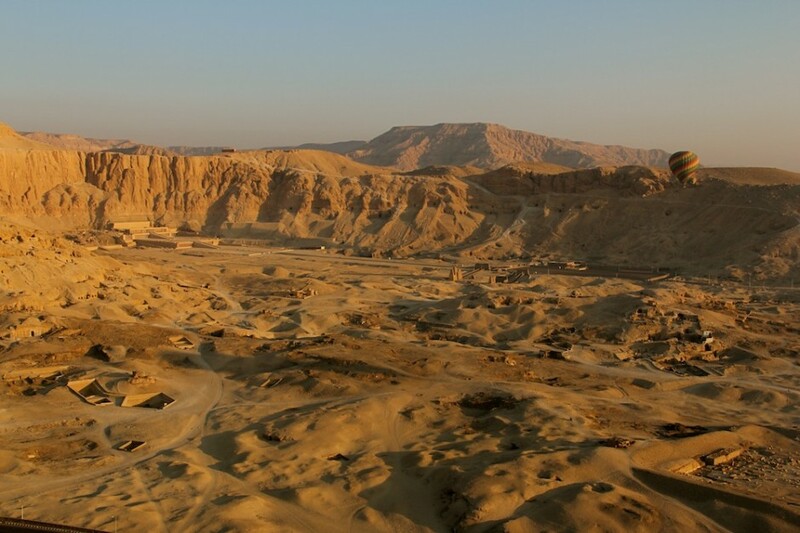 The Theban Mapping Project, led by American Egyptologist Dr. Kent Weeks, aims to map and photograph every tomb and temple. 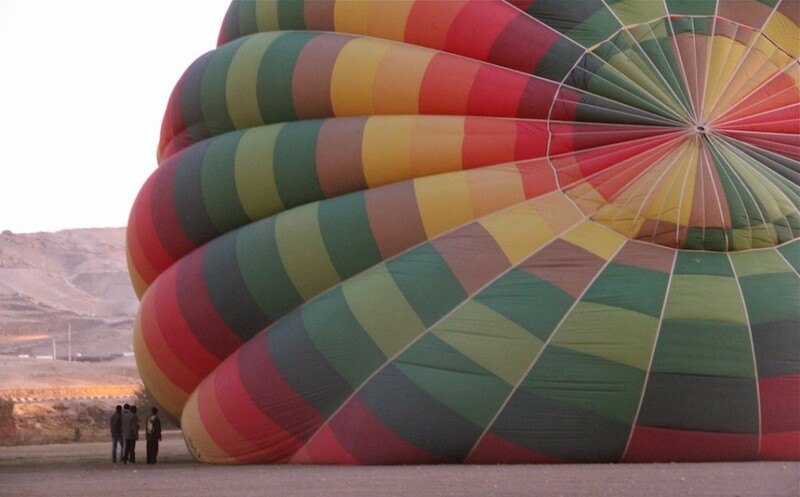 It was Weeks who first introduced hot air ballooning to the area for this purpose. Best known of the few female pharaohs, Hatshepsut ruled Egypt for around 22 years and was often depicted in masculine form, wearing a beard and kilt. 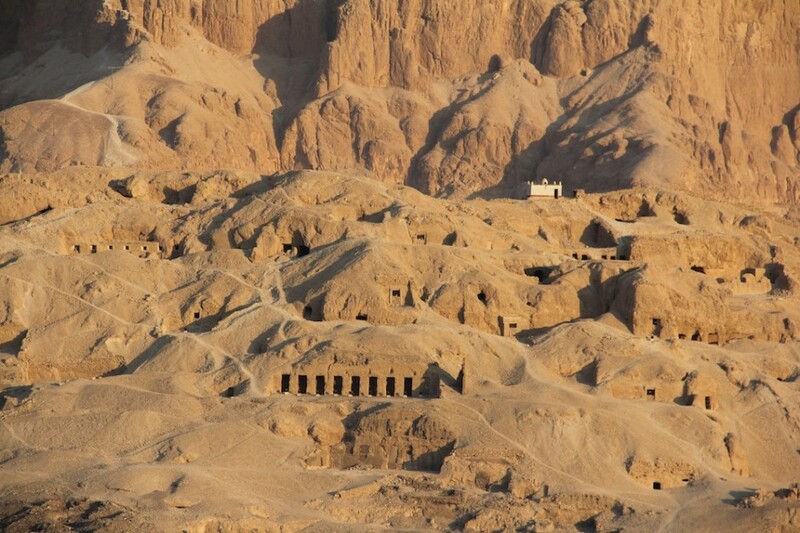 Her temple sits beneath the sheer, hanging cliffs of the Theban Hills and features great ramps and courtyards. The mortuary temple of Ramses II, third pharaoh of the 19h Dynasty. Ramses II is often described as having been obsessed with building great monuments to himself - the twin 65-foot statues of his likeness at Abu Simbel are testament to this. However, the Ramesseum's position by the edge of the Nile floodplain meant that it was inundated by the river's annual flooding for around 3000 years and today stands in ruins. 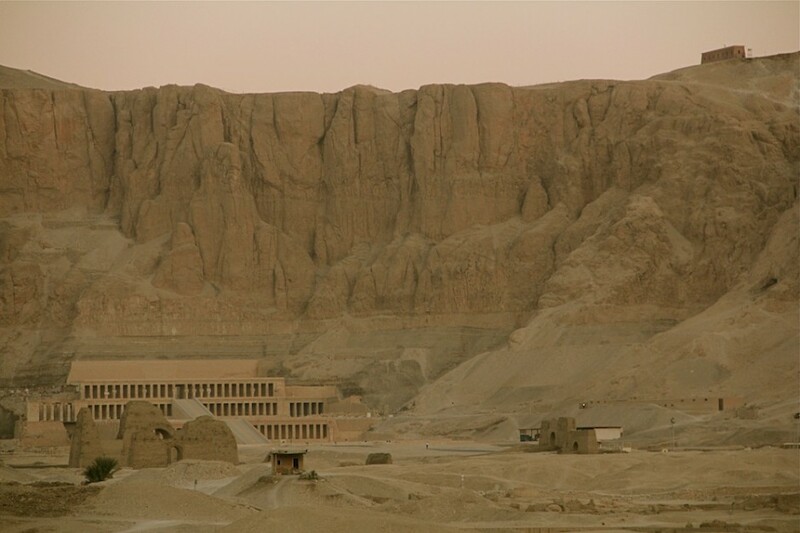 More numerous and less elaborate than their royal counterparts in the Valley of the Kings, the Tombs of the Nobles are the final resting places for high officials, scribes, and priests of the New Kingdom era. 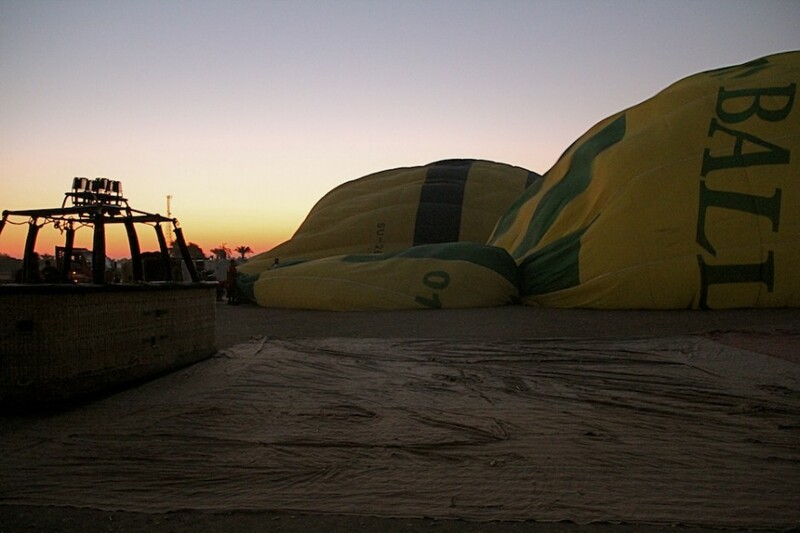 Our balloon made an effortless landing in a sugarcane field while a farmer looked on, casually smoking a cigarette. The ground crew rushed towards us and got to work. The shouts of the crew snapped my dreamy thoughts back to the present. Commemorative certificates were dispersed, someone tried to sell us a DVD, a hat came out to collect baksheesh, and the engine of our tour van started up, ready to take us on to the next stop on our Adventure Center itinerary.